After the moves 1.d4 d5 2.c4 c6 3.Nf3 Nf6 4.Nc3 e6 5.Bg5 h6 6.Bh4 dxc4 7.e4 g5 8.Bg3 b5 (D43) the Anti-Moscow Gambit arises on the board which currently is one of the most hotly contested openings in grandmaster practice. 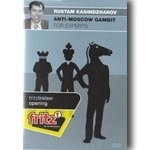 Ex-FIDE World Champion Rustam Kasimdzhanov gives an introduction into the youngest development of this variation, starting with the game Radjabov - Anand played in August 2006. His chronological presentation of the events is as exiting as a thriller, the scenes of crime being the top tournaments of the last two years and the actors the players of the absolute world elite. At the tournament in Wijk aan Zee 2008 Topalov opened a completely new chapter of the variation by beating his archrival Kramnik in the style of the masters of the 19th century, sacrificing a knight with 12.Nxf7 early on. 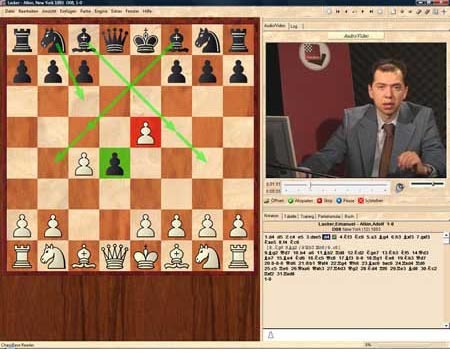 Dont miss this chess thriller (3.5 hours of video).